In the lower back video on this page, expert and online Osteopath Tim Judd explains the triggers and symptoms of low back pain and the 3D animation will show how the lower back functions and the causes of back pain. Learn about lower back pain relief. Now that you understand what causes back problems and how to prevent the most common lower back pain, it is time for targeted stretching to improve the range of motion and alleviate the pain in your lower back. Click here for a sample of just one of the 28 Lower Back Stretches available to you. For the immediate lower back relief for tension or stiffness in the lower back zone, go here for more about the Essential Lower Back Routine that can immediately ease stiffness and discomfort – or add to cart now. 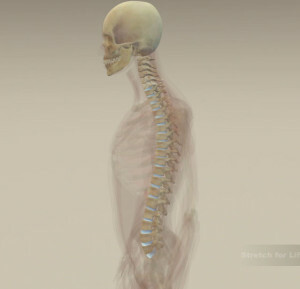 Learn from online osteopath Tim Judd about the lower back through medical anatomy and 3D animation. What causes chronic lower back pain? What are the most common low back symptoms and conditions? What is the relationship between your lower back and the hips and pelvis. Back pain – causes and prevention. What is muscle cross over and how does it affect the discs or joints of my back? I sit at a computer all day. How does this affect my back? What stretches and what exercises can I do to alleviate lower back pain? There are many reasons why you get a sore lower back and back muscle spasms. Too much sitting, inherited tendencies, poor posture or poor habits will contribute. In simple terms it is because there is too much tension in some muscles and too much slack in others. The mechanics of the spine, sacrum and pelvis become dysfunctional and you become increasingly susceptible to injury. Mostly there is a gradual build up of tension over time, the body adapts to this until it can no longer accommodate such levels of tension. Then some small event happens and you end up with severe pain and disability and difficulty with most movement. What is muscle tension? What are QLs and Paraspinal muscles? What are facet joints? What are Hip flexors and abs? The lower back includes the lumbar spine and all the associated muscles in this region. The spine is made up of vertebrae that are stacked on top of each other with a disc in between and nerves that exit between each vertebra. Also between each vertebra are a set of joints, one on each side, commonly called facet joints. These comprise of two smooth cartilage surfaces, a capsule around the outside and fluid in the middle. These joints of the spine determine how each vertebra moves in relation to each other. Life’s activities jam the vertebrae together and inflammation develops around the facet joint which in turn irritates the nerves that are exiting through this region. This irritates local muscle tissue causing pain and dysfunction.Three main muscle groups that influence the lower back and balance between these groups keeps us upright to varying degrees of physiological efficiency. The muscles to the back are the para spinal muscles. There are many smaller muscles that are an important part of the core but these will get a good stretch when you stretch the main muscle groups and will also strengthen as you strengthen the main muscles. The hip flexors are attached to the front of the lumbar vertebrae and come down through the groin to attach to the thigh. They traverse the sacroiliac joints, where the sacrum joins to the pelvis. They also traverse the hip joints. These muscles have a massive influence area and when tight, they compress the entire lower back, hip joints and pelvis together. This muscle group gets noticeably tight and painful when you sit for a time and when you stand it is really stiff and sore in the low back. You can’t stand up straight until you walk around for a while and the tight muscle eases off. Or if you are lying out straight and your lower back is sore but by bending your knees, the pain goes away. This muscle group is what pulls us into a stoop when we are older and are another cause of lower back pain. Adjustment of the lumbar can be done through the correct stretching exercise to ensure lower back pain relief. The hip flexors are the deep anterior muscles of the lower back. The other anterior muscles are the Abbs or abdominal group. We tend to lose abb strength as time passes especially after carrying and delivering babies, eating and drinking too much or being sedentary. When these muscles go slack your pelvis tips forward, the belly hangs out and you get more of a sway in your back. This tends to compress the rear of the lumbar vertebrae together, disturbing normal mechanics and creating pain and inflammation. The abbs are important in maintaining an integral relationship between the lower back and the pelvis. So generally speaking the abbs need to be toned up to improve regional mechanics and help dissipate pain and ongoing problems. The muscles to the sides of the low back are the QL muscles. If this muscle goes into spasm, you can barely walk; get in or out of a chair or turn over in bed. You can also be pulled into all sorts of kinked side bending shapes. The pain pattern when the QL goes awry is in the lower back and down into the hip region, which is quite similar to other muscle strain patterns. This type of pain is extremely common. When you have a problem in this area, go through the lower back and hip stretches for lower back pain relief. The last group are on either side of the spine at the back. There are a whole bunch of them and are collectively called the Erector Spinae Group or Para spinals. Like the others they are very important in maintaining the integrity of the curve in the lower back and of the posture of the body as a whole. When they are tight they tilt the pelvis forward which tends to sway the back. If they are slack you tend to have a rounded lower back and slouch. The para spinals work closely with the abbs. Tone in the abbs keep the pelvis tilted back and the para spinals tilt the pelvis forward. Getting optimal balance between these two groups is vital for low back function and general postural health. Toning these up is one of the key components to developing good postural hygiene and avoiding lower back strain. If the pain is serious or you are feeling pins and needles in your feet or altered sensation anywhere, you need to consult your Osteopath or doctor immediately for a medical diagnosis. When you are given the all clear then you can confidently carry on with the full Stretch for Life home program. Good posture will benefit this zone enormously. To read more from Tim’s Blog click here. To check out Tim’s Auckland practice click here. For information about conditions that affect the Lower Back click here.